This bride and groom's smiles were so infectious, I think everyone was grinning along with them as they enjoyed their first dance as husband and wife. The venue for this wedding is the Sanctuary at Admiral, an art deco style building built in West Seattle in 1929 that was first used as a church. 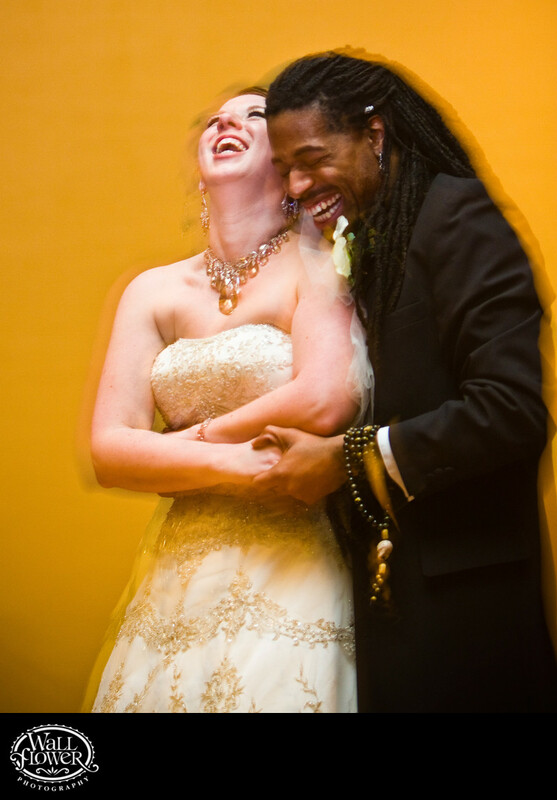 The couple met at a bead store where the bride worked — you can see that they are both fans of beaded jewelry, with the bride's chunky, sparkly crystal necklace and the groom's bracelet and beads in his dreadlocks. A slow shutter speed captured some motion blur, while a burst of bounced flash provided sharpness in the image. Check out a portrait of the groom and his groomsmen in the Created photo gallery!